Kale chips can add flavour, crunch and texture to a simple dish in need of a little something extra. I think they work especially well added to a pasta dish like the Zucchini & Soba Noodle Spinach Basil Pesto. Lately I have been experimenting with different dressings and playing around with spices, herbs, and other flavourings. One of the more versatile and popular recipes of the bunch is the Walnut Vegan Parmesan Kale Chips. This vegan treat gets its cheesy parmesan flavouring from one key ingredient- nutritional yeast. Nutritional yeast is a deactivated yeast that is jam-packed full of vitamin B's, protein, low in fat and sodium, free of dairy and sugar and most importantly, naturally tastes cheesy! If you don't already have this bulk good in your kitchen, pick some up and start tossing it on everything. 1. Using a mortar and pestle, crush the walnuts until they are mostly in fine little pieces. Don't worry about a few larger pieces throughout, as this will actually add fantastic texture to this delicious topper. 2. De-stem kale, wash and dry. Once the kale is completely dry, toss in olive oil and lightly massage the oil throughout. 3. 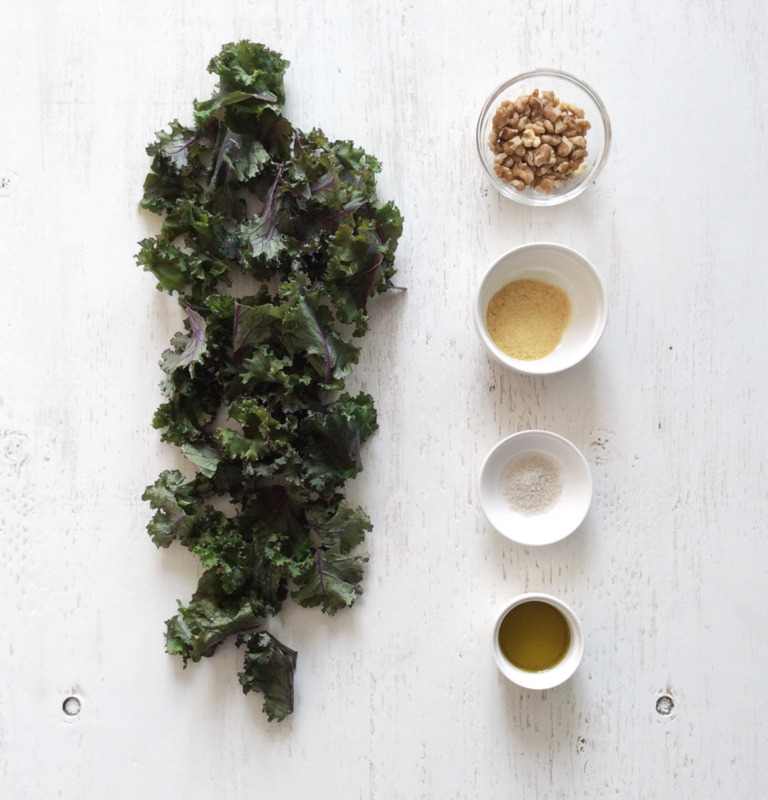 In a large bowl, mix walnuts, nutritional yeast, and a few pinches of salt with the kale. 4. Pre-heat oven to 350 degrees. While oven is heating, line baking sheet with parchment paper and evenly disperse kale onto baking sheet in a single layer. Ensure to get all the nutritional yeast, sea salt and walnut mixture from the bottom of the bowl after you have dumped the kale out- this is the best part. Put kale in the oven for 10-15 minutes, watching carefully and rotating the pan once. Once crisp, set aside to cool. Kale chips store extremely well in a Tupperware so consider making a double batch and have some ready and available to top other dishes throughout with the week.